So the other day I mentioned that I was going to go back into my archives and revisit a number of the recipes that I talked about during my first year of blogging. Recipes that I still love and still make on a regular basis. Well, a fairly regular basis. Skip back a few weeks to when I asked my hubby what he wanted me to make to eat on Día de Independencía. He said Barbacoa. Yes, I realize this is not Barbacoa. 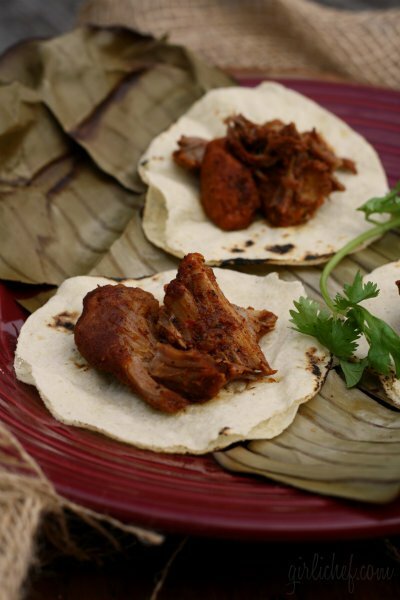 Though you can make variations of Barbacoa with pork, beef, chicken, or even fish, the type he was talking about is the type he grew up eating. And that was made from goat. I knew I'd have trouble finding goat. And I did. So I thought maybe I would just go with lamb. But I needed the shoulder, and for some reason I absolutely could not find any lamb should anywhere, either. Chops? Yes. Rack? Mm-hmm. Leg? You got it. But shoulder? Aaahhh, no. So, on to plan B. I told hubs that the Barbacoa was a no-go right now, but that the next time I found either goat or lamb shoulder, it was so on. What was his second choice, I asked. I bet you can guess what he said. Cuz you're good like that. His second choice was Puerco Pibil. Now, I was happy with that choice for two reasons. 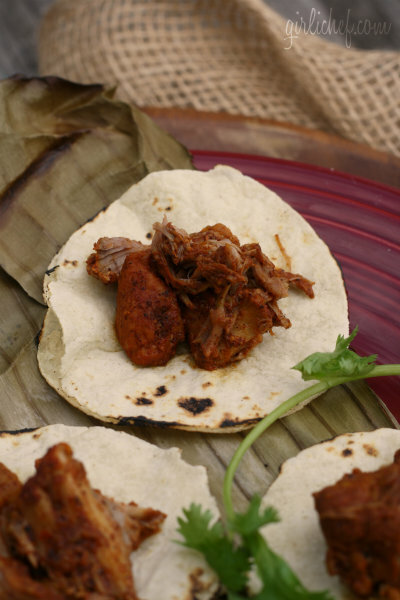 Reason numero uno - I LOVE Puerco Pibil and haven't made it in quite a while. Reason numero dos - another recipe revisit! Oh yeah. 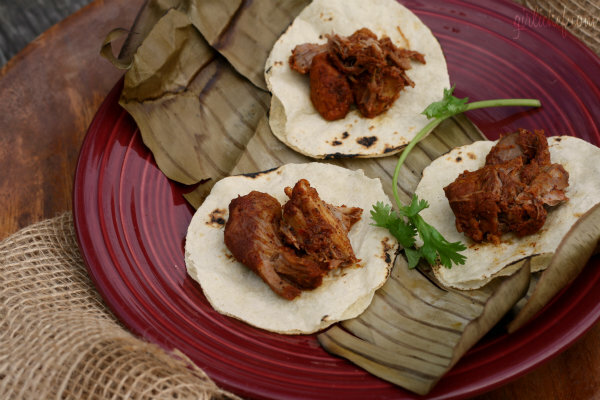 I first talked about Puerco Pibil and how I fell for it after watching Once Upon a Time in Mexico. The Robert Rodriguez film. Do you know it? Typical Robert Rodriguez- there's plenty of great actors with lots of guns and violence and humor all crescendoing to a righteous conclusion. Plus, Johnny (Depp, thank you) plays a man obsessed with finding the best Puerco Pibil in Mexico. He found it. But it pushed him over the edge. Well, if you're familiar with Rodriguez, you may know that he puts fun bits in the "special features" sections of his dvd's like 10-minute film school or 10-minute cooking school. This recipe is one that he makes and shares in the special features on Once Upon a Time in Mexico. Warning - don't watch this if you have young (or maybe even older) kids in the room! He also does do a fun 10-minute cooking school with his daughter on the special features of Shorts, if you're interested - they make cookies (and he doesn't drop the f-bomb even once). And it's way cute. Maybe you'll find yourself smiling all silly at Rodriguez like I do (yeah, he's dreamy). Well, there's another 10-minute cooking school at the end of this post if you just can't get enough. So this was the main dish in our little Mexican Independence Day celebrations. Tender, fall-apart and juicy, and perfectly spiced...it's something that I crave often. Did you cook or bake any good Mexican food this weekend? Maybe you went out to eat? Feel free to share your favorite Mexican dishes in the comments below. I'm always looking for new favorites! 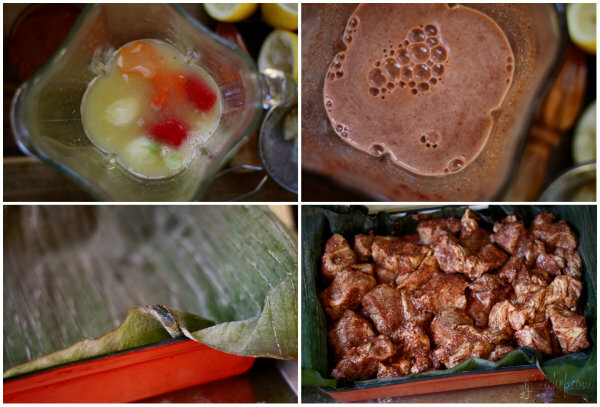 Tender, delicious pork that has been slow-roasted in banana leaves. 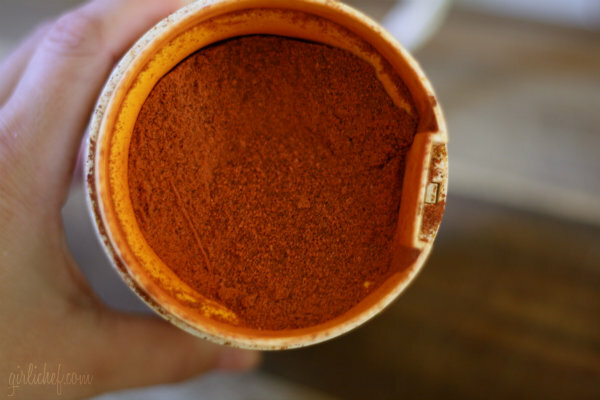 Place first 5 ingredients into a spice grinder and grind until you have a very fine dust. Annatto seeds are extremely hard, so be sure they are ground very finely so that you don't crack a tooth on them later. 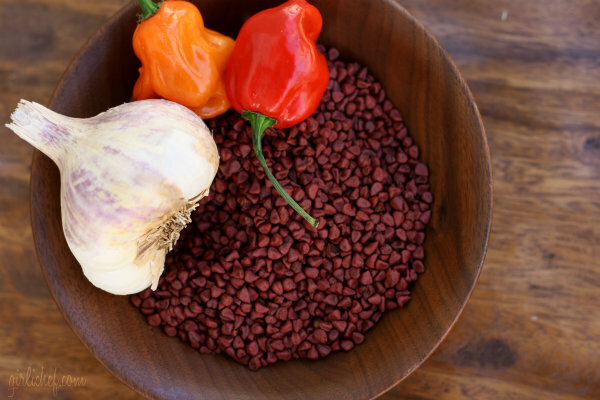 If you're using pre-ground spices, grind the annatto first, then pulse in the remaining spices. Set aside. Next up, you need to stem the habañeros and slice them in half vertically. Working carefully since they are extremely hot (use gloves or gently hold the outside skin (the unexposed, uncut part), cut out the ribs and seeds from each half. You could leave a few seeds or ribs in if you want a little kick (because once the dish is finished, it's not extremely spicy). Place the habañeros, orange juice, vinegar, salt, garlic cloves, lemon juice, and the splash of tequila in the jar of a blender. Add the reserved spice blend. Blend to combine and puree chiles and garlic. Place the pork chunks into a gallon-sized zippered baggie and pour the mixture into the blender over it. Seal baggie tightly and massage it a few times to be sure all of the meat is covered with the marinade. You can either place your pork into the fridge to marinate for up to 6 hours, or you can get it in the oven shortly. It's up to you. Be sure to preheat your oven to 325° F for 15-20 minutes before you're ready to put the pork in, though. Line a large, deep pan with a couple of banana leaves (I use a lasagna pan for this). Pour the pork, marinade and all, into the lined pan. Cover with another banana leaf, tucking it in all around. Now cover the whole thing tightly with foil. Cook in preheated oven for ~4 hours. Meat should be fall-apart, fork tender and smell tantalizing. Remove from oven and very carefully remove the foil and either pull back the banana leaves or slash the center of the leaves (releasing the steam). 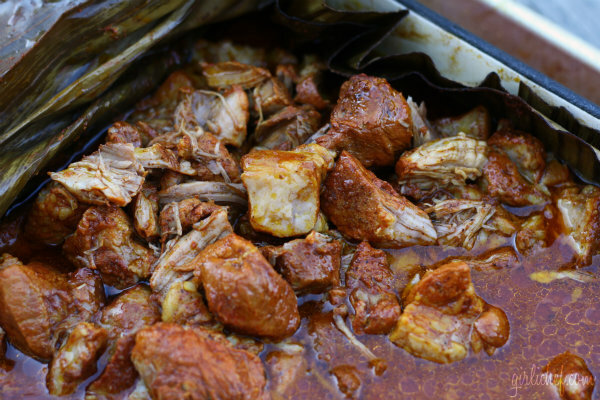 Puerco Pibil goes perfectly with a side of white rice (but of course, use any type you prefer) and some corn tortillas.